Stethoscope is a medical diagnostic tool for Auscultation which is the listening of internal sounds of the body. Auscultation is used to examine the heart sounds, breath sounds, bowel sounds etc. Auscultation requires skill, clinical experience and a good quality stethoscope. An experienced physician can distinguish normal Lub and Dub sounds of the heart as well as heart murmurs and gallops. In combination with the sphygmomanometer, the Stethoscope is used to measure the blood pressure. The Stethoscope was invented by Rene Laennec of France in 1816. 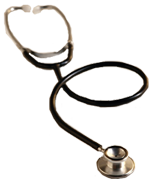 The two-sided stethoscope was invented by Rappaport and Sprague in the early 20th century.